The Hawthorn Foundation, with its membership's non-partisan support, is working in partnership with the state of Missouri and the governor's office to increase the effectiveness and efficiency of our state government. Hawthorn is bringing together private, nonprofit and public sector leaders from across the state in a variety of strategic initiatives to improve Missouri’s competitiveness. The Governor’s Innovation Task Force was the first of these efforts. The Department of Economic Development and the Hawthorn Foundation established the statewide Branding Task Force to develop a brand for Missouri that will attract more businesses, innovators, students, workers, and visitors to the state. The Task Force will mobilize public and private sector leaders within the economic development, tourism, workforce development, and innovation communities to lead the initiative. By having a cohesive brand to promote Missouri externally, the state will elevate Missouri’s reputation as a thriving innovation hub and great place to live, visit, work, go to school, and do business. The task force launches in June 2018 and is expected to conclude its work by December 2018. See the Hawthorn Workforce Collaborative page for more details. The Missouri Chief Operating Officer, in concert with the Office of Administration and Department of Revenue, convened a team of state leaders from both public and private sectors to confirm best practices for efficiently managing the state held real estate properties and facilities. The Missouri Chief Operating Officer requested the assistance of private sector fleet managers and industry representatives to study vehicle fleet practices within Missouri State Government. The state of Missouri spends approximately $98 million each year to transport state employees for official business. The COO asked for a task force to seek out opportunities to streamline fleet practices and lower the overall costs of transportation utilizing industry best practices. The task force completed its work in December 2017. Read more about the Missouri Fleet Management Task Force. 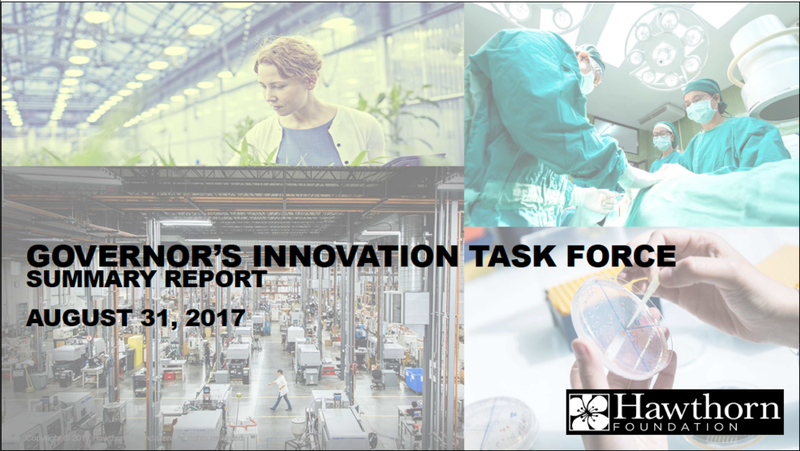 Governor Greitens established the Governor’s Innovation Task Force (GITF) in 2017 to (1) develop a fact-based perspective on the state of innovation and entrepreneurship in Missouri and (2) suggest options for potential state government actions to promote innovation and new technology start-ups across the state. Over 2000 people participated in some way during the GITF process, and the task force completed its summary report within 75 days of launch. Read more about the GITF. In keeping with Governor Parson’s commitment to infrastructure improvement in Missouri, the Hawthorn infrastructure committee has been absorbed into a new governor’s task force. The Governor’s Infrastructure Task Force will meet at regional locations, report out its findings upon completion of its work, assisting in shaping the path forward for Missouri’s infrastructure improvement. This task force will include leaders from transportation, utilities, other significant business leaders, and a number of statewide stakeholders.